Dell XPS 15 9570 is a great laptop which is suitable for content creators and programmers. Additionally, it can be used by students who game occasionally. The display is great to look at and has excellent viewing angles. Small bezels and the anti-glare coating take it a step further in the game. It achieves that 100% mark for sRGB and 97% for Adobe RGB which makes it the first choice for photo and video editors. One common thing about Dell Laptop is that they are lighter and most importantly cheaper. Find out how Dell’s XPS series been able to maintain that premium standard in the Dell XPS 15 9570. When Dell first launched the XPS lineup in 2015, it started a revolution in the portable computer industry. Laptops back then were bulky and looked plain ugly. If someone wanted a powerful and light notebook, they had no other choice than Apple’s Macbook. Dell changed this by introducing their XPS laptops that were incredibly thin yet amazingly powerful. Both the i7 and the i9 variants are coupled with a GTX 1050 Ti. Dell XPS 15 9570 is a great laptop, and there’s not much to complain about it. There are some areas where Dell could have done better. For instance, Dell has used a Toshiba SSD which gives a good read speed of 2800 MB/s but an abysmal write speed of 400 MB/s. They could’ve used Samsung Evo SSD as there’s not a huge price difference between both of them. One more thing where Dell could have done better is the thermals. The laptop gets quite hot under load and sometimes even throttles the processors. However, despite all these drawbacks, it is hard to find even a single fault. We are going to tell why buying this laptop is worth for your money. Without wasting much time, let’s have a look at the Dell XPS 15 9570 Review. The laptop looks stunning with its chassis made up of soft aluminum which gives it an excellent finish. The middle portion that houses keyboard and trackpad is made up of carbon fiber and looks pleasing to the eyes. It is soft, almost-rubberized material extends to the very top of the keyboard deck, wraps around the Function row and ends at the hinges. As a result, XPS 15 gives the user a unique experience to work with. As it is a densely built laptop, there is no flex on the keyboard or display. 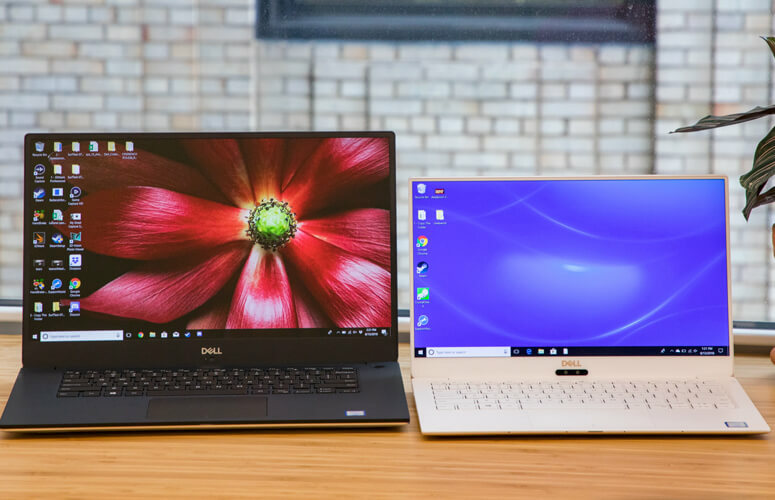 The almost bezel-less display makes it a delight to look at and makes the Dell XPS 15 9570 to stand apart from the rest of the laptops available in the market. The display has the webcam which is awkwardly positioned, but it offers the best picture quality. It can also be used to set up facial recognition for Windows Hello. 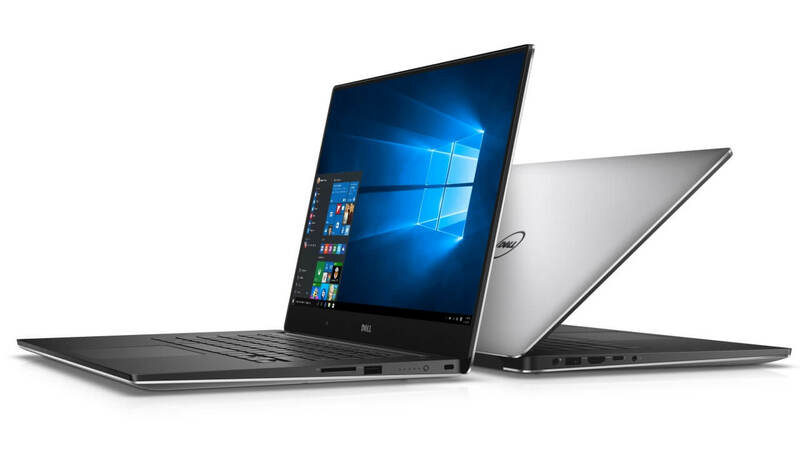 Dell’s XPS 15 9570 is compacted with the same features as its previous versions of Dell XPS 15 that was launched in the same year. They both have the processor of core i7 8750H and go all the way up to an i9 8950 HK. While the RAM is the most significant feature of this version, the i7 variant comes with 8 GB of DDR5 RAM clocked at 2666 MHz whereas the i9 version comes packed with 32 GB of RAM. Though it is integrated with Intel UHD Graphics 630, Dell has equipped XPS 15 9570 with an Nvidia GTX 1050 Ti with Max Q-design GPU. This is achieved due to its lower clocks, which is around 200MHz; it is lower as compared to other GPU versions. When this GPU was installed inside the ZenBook Pro 15, it has been found that GTX 1060 Ti Max-Q is at least 50% faster than the GTX 1050. Its power button resides at the top right-hand side of the keyboard and doubles up as the fingerprint sensor. It can be used to login using Windows Hello, similarly as in Huawei Matebook X Pro. The keyboard is backlit and provides tactile feedback for key presses. Its trackpad is smooth and uses Windows precision drivers. Dell XPS 15 9570 packs in everything that a modern laptop user requires. It is best suited for students and working officials who like to game occasionally. It is a powerful machine and can handle every task that you throw at it. However, at a price tag of approximately $2000 for the i7 version and $4900 for the i9 variant, these are a bit on the premium side. The 15-inch screen on the Dell XPS 15 9570 looks stunning. It’s crisp and sharp. The colors come out nicely – thanks to the 100% sRGB and 97% Adobe RGB color gamut. The anti-glare coating adds more to the beauty of this display. Its Viewing angles are great, and there is no color shifting at all. The screen gets reasonably brighter and can be used outdoors easily. The speakers sit in the front and are good enough to watch movies and YouTube videos. The fans are quiet and don’t make much sound unless you crank them up. The laptop provides good connectivity with a great set of ports. It has one USB type-A port, one Thunderbolt 3-port, one full HDMI port and a Headphone jack on the left. The battery meter, another USB type-A port, SD card reader and Kensington lock reside on the right side. The Thunderbolt 3-port provides support for four lanes of PCI Express Gen 3 which means that it can be used with an external GPU. 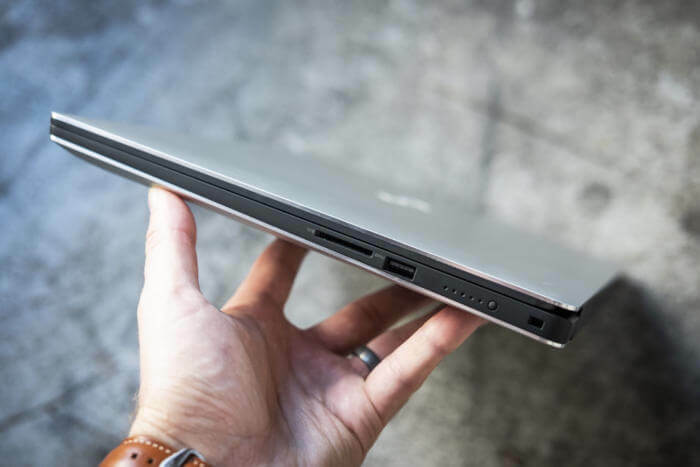 The Dell XPS 15 9570 offers a complete set of ports. The PowerShares Port is on the right attributed by full-sized SD Card reader and also USB of 3.1 Gen. On the left, you can find USB type A-port along with the barrel-plug charging port. The USB in this port also supported by PowerShares feature with Gen 1 module. Among the ports, the Thunderbolt 3 Powershare is the highlight which is supported by a full-sized HDMI 2.0 port. There are 4-lanes of PCI express for the Display port with DC-In module. Apart from them, one can find the port for 3.5mm combo with headphone/mic slot. You can find a slot for the security powered by Kensington lock for the Dell battery gauge indicator which is the signature of this product. Instead of Intel WLAN Card, Dell XPS 15 9570 is featured with the Killer 15355 802.11 ac 2*2 Wi-Fi and Bluetooth 4.2 which will automatically decide which help needs more bandwidth and allocate it accordingly. It also has an option to connect an Ethernet cable with a dongle and allows it to decide whether it needs to use LAN or Wi-Fi to connect your devices with the internet. Due to this, Dell XPS 15 9570 is capable of stream your YouTube videos faster as compared to other Laptops available in the market. The Dell XPS 15 9570 is an absolute beast and can handle pretty heavy tasks easily. Moreover, we’re talking about the i7 variant here. The i9 version is a monster and can carry out humongous tasks without breaking a sweat. The 1050Ti isn’t that powerful but keeping in mind that the laptop wasn’t built for gaming, it performs decently. The laptop achieves 60 FPS on modern AAA titles easily. Dell XPS 15 9570 is a high-end Windows laptop, and you won’t find many alternatives to it. It is thin and light but packs some crazy horsepower inside. All the last year models were quite impressive. Moreover, for this year XPS 15 2-in-1 was the premier launch, and the series followed by them took XPS 15 to another level. Their core technology is the main contribution for them to give standards in the industry. Even with or without a 4K screen they make the best come back in this series. Also, while comparing the price with MacBook Pro which is 15-inch display, XPS 15 has been preferred by many professionals and programmers across the globe as you will be saving a lot without any compromise on high-tech configurations. 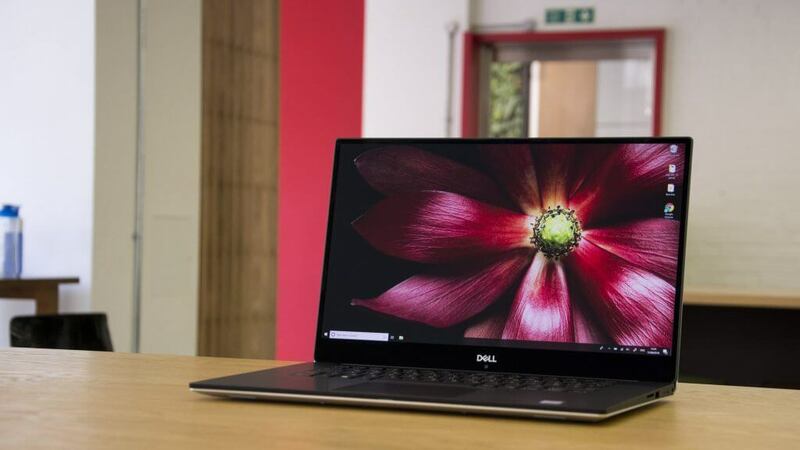 From the above Dell XPS 15 9570 Review, we find that the XPS series could not get any better after this XPS15 launch, and it is still doing wonders in the industry and its customers.